Transition metals are defined as those elements that have (or readily form) partially filled d orbitals. As shown in [link], the d-block elements in groups 3–11 are transition elements. The f-block elements, also called inner transition metals (the lanthanides and actinides), also meet this criterion because the d orbital is partially occupied before the f orbitals. The d orbitals fill with the copper family (group 11); for this reason, the next family (group 12) are technically not transition elements. However, the group 12 elements do display some of the same chemical properties and are commonly included in discussions of transition metals. Some chemists do treat the group 12 elements as transition metals. The transition metals are located in groups 3–11 of the periodic table. 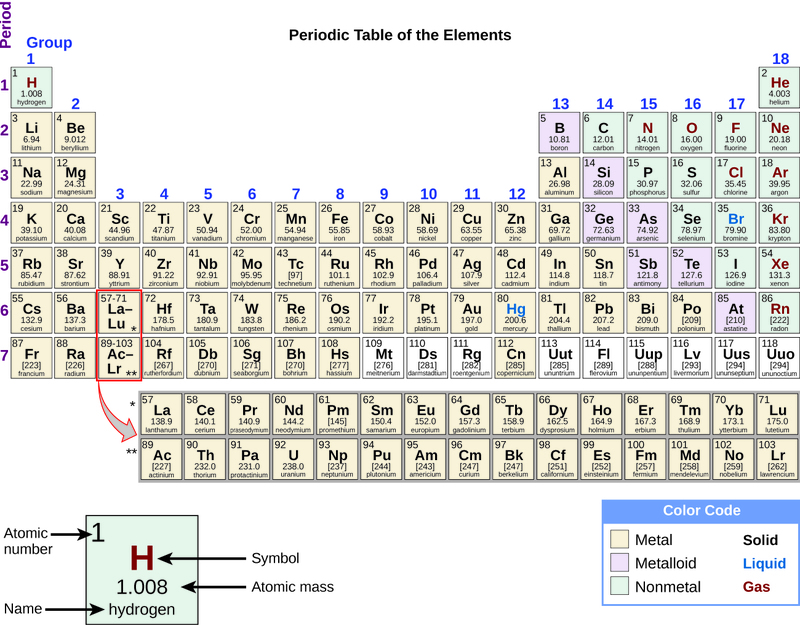 The inner transition metals are in the two rows below the body of the table. The d-block elements are divided into the first transition series (the elements Sc through Cu), the second transition series (the elements Y through Ag), and the third transition series (the element La and the elements Hf through Au). Actinium, Ac, is the first member of the fourth transition series, which also includes Rf through Rg. The f-block elements are the elements Ce through Lu, which constitute the lanthanide series (or lanthanoid series), and the elements Th through Lr, which constitute the actinide series (or actinoid series). Because lanthanum behaves very much like the lanthanide elements, it is considered a lanthanide element, even though its electron configuration makes it the first member of the third transition series. Similarly, the behavior of actinium means it is part of the actinide series, although its electron configuration makes it the first member of the fourth transition series. For the examples that are transition metals, determine to which series they belong. For ions, the s-valence electrons are lost prior to the d or f electrons. (a) Ce3+[Xe]4f1; Ce3+ is an inner transition element in the lanthanide series. (b) Pb2+[Xe]6s25d104f14; the electrons are lost from the p orbital. This is a main group element. Give an example of an ion from the first transition series with no d electrons. V5+ is one possibility. Other examples include Sc3+, Ti4+, Cr6+, and Mn7+. Lanthanides (elements 57–71) are fairly abundant in the earth’s crust, despite their historic characterization as rare earth elements. Thulium, the rarest naturally occurring lanthanoid, is more common in the earth’s crust than silver (4.5 10−5% versus 0.79 10−5% by mass). There are 17 rare earth elements, consisting of the 15 lanthanoids plus scandium and yttrium. They are called rare because they were once difficult to extract economically, so it was rare to have a pure sample; due to similar chemical properties, it is difficult to separate any one lanthanide from the others. However, newer separation methods, such as ion exchange resins similar to those found in home water softeners, make the separation of these elements easier and more economical. Most ores that contain these elements have low concentrations of all the rare earth elements mixed together. The commercial applications of lanthanides are growing rapidly. For example, europium is important in flat screen displays found in computer monitors, cell phones, and televisions. Neodymium is useful in laptop hard drives and in the processes that convert crude oil into gasoline ([link]). Holmium is found in dental and medical equipment. In addition, many alternative energy technologies rely heavily on lanthanoids. Neodymium and dysprosium are key components of hybrid vehicle engines and the magnets used in wind turbines. As the demand for lanthanide materials has increased faster than supply, prices have also increased. In 2008, dysprosium cost 110/kg; by 2014, the price had increased to 470/kg. Increasing the supply of lanthanoid elements is one of the most significant challenges facing the industries that rely on the optical and magnetic properties of these materials. The transition elements have many properties in common with other metals. They are almost all hard, high-melting solids that conduct heat and electricity well. They readily form alloys and lose electrons to form stable cations. In addition, transition metals form a wide variety of stable coordination compounds, in which the central metal atom or ion acts as a Lewis acid and accepts one or more pairs of electrons. Many different molecules and ions can donate lone pairs to the metal center, serving as Lewis bases. In this chapter, we shall focus primarily on the chemical behavior of the elements of the first transition series. Transition metals demonstrate a wide range of chemical behaviors. As can be seen from their reduction potentials (see Appendix H), some transition metals are strong reducing agents, whereas others have very low reactivity. For example, the lanthanides all form stable 3+ aqueous cations. The driving force for such oxidations is similar to that of alkaline earth metals such as Be or Mg, forming Be2+ and Mg2+. On the other hand, materials like platinum and gold have much higher reduction potentials. Their ability to resist oxidation makes them useful materials for constructing circuits and jewelry. Ruthenium, osmium, rhodium, iridium, palladium, and platinum are the platinum metals. With difficulty, they form simple cations that are stable in water, and, unlike the earlier elements in the second and third transition series, they do not form stable oxyanions. Both the d– and f-block elements react with nonmetals to form binary compounds; heating is often required. These elements react with halogens to form a variety of halides ranging in oxidation state from 1+ to 6+. On heating, oxygen reacts with all of the transition elements except palladium, platinum, silver, and gold. The oxides of these latter metals can be formed using other reactants, but they decompose upon heating. The f-block elements, the elements of group 3, and the elements of the first transition series except copper react with aqueous solutions of acids, forming hydrogen gas and solutions of the corresponding salts. Transition metals can form compounds with a wide range of oxidation states. Some of the observed oxidation states of the elements of the first transition series are shown in [link]. As we move from left to right across the first transition series, we see that the number of common oxidation states increases at first to a maximum towards the middle of the table, then decreases. The values in the table are typical values; there are other known values, and it is possible to synthesize new additions. For example, in 2014, researchers were successful in synthesizing a new oxidation state of iridium (9+). Transition metals of the first transition series can form compounds with varying oxidation states. For the elements scandium through manganese (the first half of the first transition series), the highest oxidation state corresponds to the loss of all of the electrons in both the s and d orbitals of their valence shells. The titanium(IV) ion, for example, is formed when the titanium atom loses its two 3d and two 4s electrons. These highest oxidation states are the most stable forms of scandium, titanium, and vanadium. However, it is not possible to continue to remove all of the valence electrons from metals as we continue through the series. Iron is known to form oxidation states from 2+ to 6+, with iron(II) and iron(III) being the most common. Most of the elements of the first transition series form ions with a charge of 2+ or 3+ that are stable in water, although those of the early members of the series can be readily oxidized by air. The elements of the second and third transition series generally are more stable in higher oxidation states than are the elements of the first series. In general, the atomic radius increases down a group, which leads to the ions of the second and third series being larger than are those in the first series. Removing electrons from orbitals that are located farther from the nucleus is easier than removing electrons close to the nucleus. For example, molybdenum and tungsten, members of group 6, are limited mostly to an oxidation state of 6+ in aqueous solution. Chromium, the lightest member of the group, forms stable Cr3+ ions in water and, in the absence of air, less stable Cr2+ ions. The sulfide with the highest oxidation state for chromium is Cr2S3, which contains the Cr3+ ion. Molybdenum and tungsten form sulfides in which the metals exhibit oxidation states of 4+ and 6+. Which is the strongest oxidizing agent in acidic solution: dichromate ion, which contains chromium(VI), permanganate ion, which contains manganese(VII), or titanium dioxide, which contains titanium(IV)? A larger reduction potential means that it is easier to reduce the reactant. Permanganate, with the largest reduction potential, is the strongest oxidizer under these conditions. Dichromate is next, followed by titanium dioxide as the weakest oxidizing agent (the hardest to reduce) of this set. Predict what reaction (if any) will occur between HCl and Co(s), and between HBr and Pt(s). You will need to use the standard reduction potentials from Appendix L.
Ancient civilizations knew about iron, copper, silver, and gold. The time periods in human history known as the Bronze Age and Iron Age mark the advancements in which societies learned to isolate certain metals and use them to make tools and goods. Naturally occurring ores of copper, silver, and gold can contain high concentrations of these metals in elemental form ([link]). Iron, on the other hand, occurs on earth almost exclusively in oxidized forms, such as rust (Fe2O3). The earliest known iron implements were made from iron meteorites. Surviving iron artifacts dating from approximately 4000 to 2500 BC are rare, but all known examples contain specific alloys of iron and nickel that occur only in extraterrestrial objects, not on earth. It took thousands of years of technological advances before civilizations developed iron smelting, the ability to extract a pure element from its naturally occurring ores and for iron tools to become common. Generally, the transition elements are extracted from minerals found in a variety of ores. However, the ease of their recovery varies widely, depending on the concentration of the element in the ore, the identity of the other elements present, and the difficulty of reducing the element to the free metal. In general, it is not difficult to reduce ions of the d-block elements to the free element. Carbon is a sufficiently strong reducing agent in most cases. However, like the ions of the more active main group metals, ions of the f-block elements must be isolated by electrolysis or by reduction with an active metal such as calcium. We shall discuss the processes used for the isolation of iron, copper, and silver because these three processes illustrate the principal means of isolating most of the d-block metals. In general, each of these processes involves three principal steps: preliminary treatment, smelting, and refining. Preliminary treatment. In general, there is an initial treatment of the ores to make them suitable for the extraction of the metals. This usually involves crushing or grinding the ore, concentrating the metal-bearing components, and sometimes treating these substances chemically to convert them into compounds that are easier to reduce to the metal. Smelting. The next step is the extraction of the metal in the molten state, a process called smelting, which includes reduction of the metallic compound to the metal. Impurities may be removed by the addition of a compound that forms a slag—a substance with a low melting point that can be readily separated from the molten metal. Refining. The final step in the recovery of a metal is refining the metal. Low boiling metals such as zinc and mercury can be refined by distillation. When fused on an inclined table, low melting metals like tin flow away from higher-melting impurities. Electrolysis is another common method for refining metals. The early application of iron to the manufacture of tools and weapons was possible because of the wide distribution of iron ores and the ease with which iron compounds in the ores could be reduced by carbon. For a long time, charcoal was the form of carbon used in the reduction process. The production and use of iron became much more widespread about 1620, when coke was introduced as the reducing agent. Coke is a form of carbon formed by heating coal in the absence of air to remove impurities. The first step in the metallurgy of iron is usually roasting the ore (heating the ore in air) to remove water, decomposing carbonates into oxides, and converting sulfides into oxides. The oxides are then reduced in a blast furnace that is 80–100 feet high and about 25 feet in diameter ([link]) in which the roasted ore, coke, and limestone (impure CaCO3) are introduced continuously into the top. Molten iron and slag are withdrawn at the bottom. The entire stock in a furnace may weigh several hundred tons. Within a blast furnace, different reactions occur in different temperature zones. Carbon monoxide is generated in the hotter bottom regions and rises upward to reduce the iron oxides to pure iron through a series of reactions that take place in the upper regions. The carbon monoxide serves as the reducing agent in the upper regions of the furnace. The individual reactions are indicated in [link]. Just below the middle of the furnace, the temperature is high enough to melt both the iron and the slag. They collect in layers at the bottom of the furnace; the less dense slag floats on the iron and protects it from oxidation. 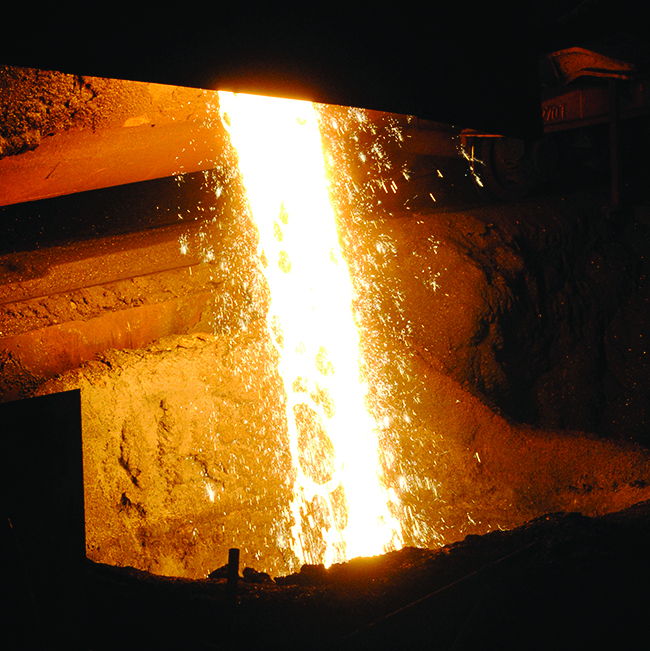 Several times a day, the slag and molten iron are withdrawn from the furnace. The iron is transferred to casting machines or to a steelmaking plant ([link]). Much of the iron produced is refined and converted into steel. Steel is made from iron by removing impurities and adding substances such as manganese, chromium, nickel, tungsten, molybdenum, and vanadium to produce alloys with properties that make the material suitable for specific uses. Most steels also contain small but definite percentages of carbon (0.04%–2.5%). However, a large part of the carbon contained in iron must be removed in the manufacture of steel; otherwise, the excess carbon would make the iron brittle. You can watch an animation of steelmaking that walks you through the process. In these reactions, the silicon dioxide behaves as a Lewis acid, which accepts a pair of electrons from the Lewis base (the oxide ion). The copper obtained in this way is called blister copper because of its characteristic appearance, which is due to the air blisters it contains ([link]). This impure copper is cast into large plates, which are used as anodes in the electrolytic refining of the metal (which is described in the chapter on electrochemistry). The charges, as well as the atoms, must balance in reactions. The silver atom is being oxidized from the 0 oxidation state to the 1+ state. Whenever something loses electrons, something must also gain electrons (be reduced) to balance the equation. Oxygen is a good oxidizing agent for these reactions because it can gain electrons to go from the 0 oxidation state to the 2− state. During the refining of iron, carbon must be present in the blast furnace. 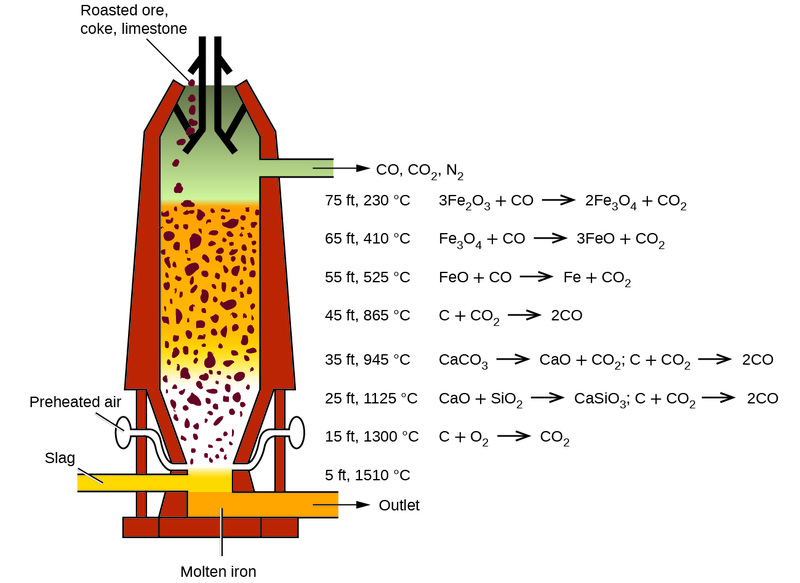 Why is carbon necessary to convert iron oxide into iron? The carbon is converted into CO, which is the reducing agent that accepts electrons so that iron(III) can be reduced to iron(0). The bonding in the simple compounds of the transition elements ranges from ionic to covalent. In their lower oxidation states, the transition elements form ionic compounds; in their higher oxidation states, they form covalent compounds or polyatomic ions. The variation in oxidation states exhibited by the transition elements gives these compounds a metal-based, oxidation-reduction chemistry. The chemistry of several classes of compounds containing elements of the transition series follows. The stoichiometry of the metal halide that results from the reaction of the metal with a halogen is determined by the relative amounts of metal and halogen and by the strength of the halogen as an oxidizing agent. Generally, fluorine forms fluoride-containing metals in their highest oxidation states. The other halogens may not form analogous compounds. The polarity of bonds with transition metals varies based not only upon the electronegativities of the atoms involved but also upon the oxidation state of the transition metal. Remember that bond polarity is a continuous spectrum with electrons being shared evenly (covalent bonds) at one extreme and electrons being transferred completely (ionic bonds) at the other. No bond is ever 100% ionic, and the degree to which the electrons are evenly distributed determines many properties of the compound. Transition metal halides with low oxidation numbers form more ionic bonds. For example, titanium(II) chloride and titanium(III) chloride (TiCl2 and TiCl3) have high melting points that are characteristic of ionic compounds, but titanium(IV) chloride (TiCl4) is a volatile liquid, consistent with having covalent titanium-chlorine bonds. All halides of the heavier d-block elements have significant covalent characteristics. As with the halides, the nature of bonding in oxides of the transition elements is determined by the oxidation state of the metal. Oxides with low oxidation states tend to be more ionic, whereas those with higher oxidation states are more covalent. These variations in bonding are because the electronegativities of the elements are not fixed values. The electronegativity of an element increases with increasing oxidation state. Transition metals in low oxidation states have lower electronegativity values than oxygen; therefore, these metal oxides are ionic. Transition metals in very high oxidation states have electronegativity values close to that of oxygen, which leads to these oxides being covalent. The oxides of the first transition series can be prepared by heating the metals in air. These oxides are Sc2O3, TiO2, V2O5, Cr2O3, Mn3O4, Fe3O4, Co3O4, NiO, and CuO. Chromium(VI) oxide and manganese(VII) oxide react with water to form the acids H2CrO4 and HMnO4, respectively. These substances do not contain hydroxide ions. However, both the hydroxides and the hydrated oxides react with acids to form salts and water. When precipitating a metal from solution, it is necessary to avoid an excess of hydroxide ion, as this may lead to complex ion formation as discussed later in this chapter. The precipitated metal hydroxides can be separated for further processing or for waste disposal. The reactions of the transition metal carbonates are similar to those of the active metal carbonates. They react with acids to form metals salts, carbon dioxide, and water. Upon heating, they decompose, forming the transition metal oxides. In many respects, the chemical behavior of the elements of the first transition series is very similar to that of the main group metals. In particular, the same types of reactions that are used to prepare salts of the main group metals can be used to prepare simple ionic salts of these elements. In our discussion of oxides in this section, we have seen that reactions of the covalent oxides of the transition elements with hydroxides form salts that contain oxyanions of the transition elements. A superconductor is a substance that conducts electricity with no resistance. This lack of resistance means that there is no energy loss during the transmission of electricity. This would lead to a significant reduction in the cost of electricity. Most currently used, commercial superconducting materials, such as NbTi and Nb3Sn, do not become superconducting until they are cooled below 23 K (−250 °C). This requires the use of liquid helium, which has a boiling temperature of 4 K and is expensive and difficult to handle. The cost of liquid helium has deterred the widespread application of superconductors. One of the most exciting scientific discoveries of the 1980s was the characterization of compounds that exhibit superconductivity at temperatures above 90 K. (Compared to liquid helium, 90 K is a high temperature.) Typical among the high-temperature superconducting materials are oxides containing yttrium (or one of several rare earth elements), barium, and copper in a 1:2:3 ratio. The formula of the ionic yttrium compound is YBa2Cu3O7. The new materials become superconducting at temperatures close to 90 K ([link]), temperatures that can be reached by cooling with liquid nitrogen (boiling temperature of 77 K). Not only are liquid nitrogen-cooled materials easier to handle, but the cooling costs are also about 1000 times lower than for liquid helium. The resistance of the high-temperature superconductor YBa2Cu3O7 varies with temperature. 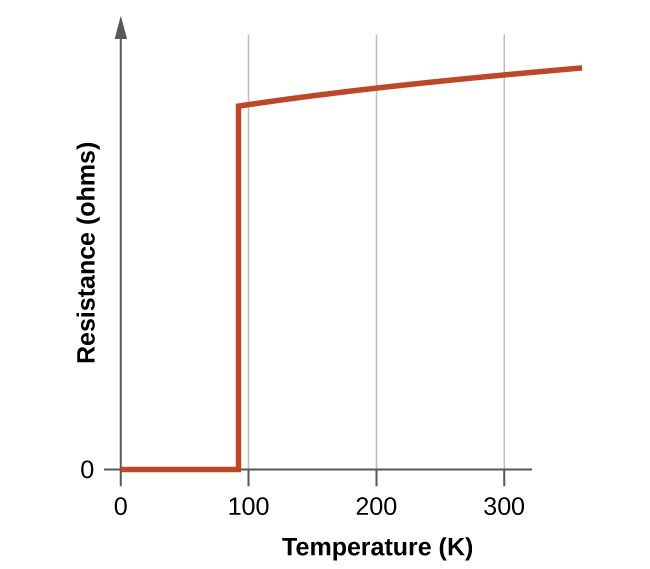 Note how the resistance falls to zero below 92 K, when the substance becomes superconducting. Although the brittle, fragile nature of these materials presently hampers their commercial applications, they have tremendous potential that researchers are hard at work improving their processes to help realize. Superconducting transmission lines would carry current for hundreds of miles with no loss of power due to resistance in the wires. This could allow generating stations to be located in areas remote from population centers and near the natural resources necessary for power production. The first project demonstrating the viability of high-temperature superconductor power transmission was established in New York in 2008. Researchers are also working on using this technology to develop other applications, such as smaller and more powerful microchips. In addition, high-temperature superconductors can be used to generate magnetic fields for applications such as medical devices, magnetic levitation trains, and containment fields for nuclear fusion reactors ([link]). The transition metals are elements with partially filled d orbitals, located in the d-block of the periodic table. The reactivity of the transition elements varies widely from very active metals such as scandium and iron to almost inert elements, such as the platinum metals. The type of chemistry used in the isolation of the elements from their ores depends upon the concentration of the element in its ore and the difficulty of reducing ions of the elements to the metals. Metals that are more active are more difficult to reduce. Which of the following elements is most likely to be used to prepare La by the reduction of La2O3: Al, C, or Fe? Why? Which of the following elements is most likely to form an oxide with the formula MO3: Zr, Nb, or Mo? The CaSiO3 slag is less dense than the molten iron, so it can easily be separated. Also, the floating slag layer creates a barrier that prevents the molten iron from exposure to O2, which would oxidize the Fe back to Fe2O3. Iron(II) can be oxidized to iron(III) by dichromate ion, which is reduced to chromium(III) in acid solution. 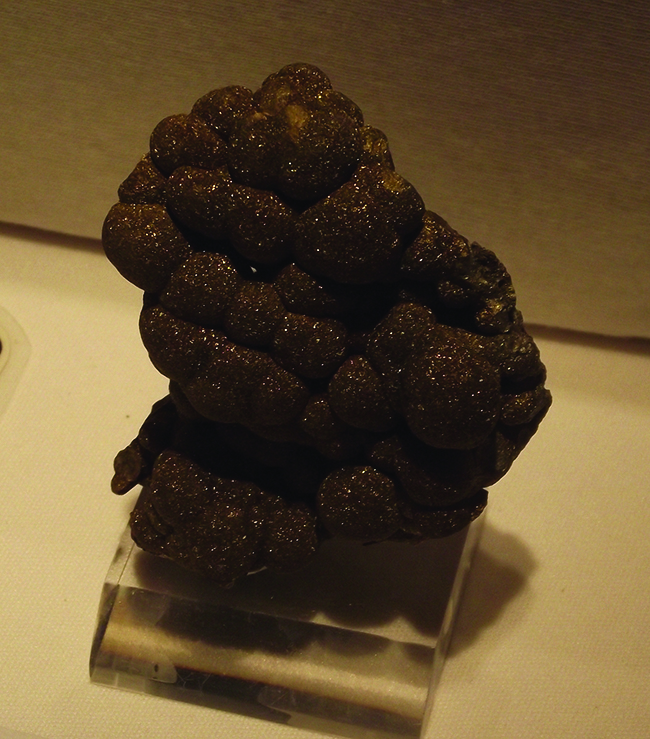 A 2.5000-g sample of iron ore is dissolved and the iron converted into iron(II). Exactly 19.17 mL of 0.0100 M Na2Cr2O7 is required in the titration. What percentage of the ore sample was iron? How many cubic feet of air at a pressure of 760 torr and 0 °C is required per ton of Fe2O3 to convert that Fe2O3 into iron in a blast furnace? For this exercise, assume air is 19% oxygen by volume. A 2.5624-g sample of a pure solid alkali metal chloride is dissolved in water and treated with excess silver nitrate. The resulting precipitate, filtered and dried, weighs 3.03707 g. What was the percent by mass of chloride ion in the original compound? What is the identity of the salt? The standard reduction potential for the reaction is about 1.8 V. The reduction potential for the reaction is +0.1 V. Calculate the cell potentials to show whether the complex ions, [Co(H2O)6]2+ and/or [Co(NH3)6]2+, can be oxidized to the corresponding cobalt(III) complex by oxygen. Describe the electrolytic process for refining copper. Predict the products of the following reactions and balance the equations. (a) Zn is added to a solution of Cr2(SO4)3 in acid. (b) FeCl2 is added to a solution containing an excess of in hydrochloric acid. (c) Cr2+ is added to in acid solution. (d) Mn is heated with CrO3. (e) CrO is added to 2HNO3 in water. (f) FeCl3 is added to an aqueous solution of NaOH. What is the gas produced when iron(II) sulfide is treated with a nonoxidizing acid? Predict the products of each of the following reactions and then balance the chemical equations. (a) Fe is heated in an atmosphere of steam. (b) NaOH is added to a solution of Fe(NO3)3. (c) FeSO4 is added to an acidic solution of KMnO4. (d) Fe is added to a dilute solution of H2SO4. (e) A solution of Fe(NO3)2 and HNO3 is allowed to stand in air. (f) FeCO3 is added to a solution of HClO4. (g) Fe is heated in air. Balance the following equations by oxidation-reduction methods; note that three elements change oxidation state. Dilute sodium cyanide solution is slowly dripped into a slowly stirred silver nitrate solution. A white precipitate forms temporarily but dissolves as the addition of sodium cyanide continues. Use chemical equations to explain this observation. Silver cyanide is similar to silver chloride in its solubility. Predict which will be more stable, [CrO4]2− or [WO4]2−, and explain. Occurrence, Preparation, and Properties of Transition Metals and Their Compounds by OpenStaxCollege is licensed under a Creative Commons Attribution 4.0 International License, except where otherwise noted.